Before Haussmann’s renovations, Paris had a medieval urban structure, with narrow and sinuous streets without sidewalks or decent sewers. It was thus quite uncomfortable for pedestrians, usually splashed by mud and rain… The only nice places for strolling were the wide Grands Boulevards, equipped with sidewalks. In early 19th century, with the raising of the bourgeoisie, a new type of street (which later spread all over Europe, see this example in Brussels) was created in order to facilitate the connection between the city centre and the Grands Boulevards. Covered arcades, which used new materials like iron and glass. More than 100 of such passages couverts were created, and they can be considered the ancestors of our shopping malls. Then, when the city was modernized and new shopping centers were created (like Printemps, Galeries Lafayette…), most of these covered arcades were destroyed. Thankfully about 20 of them survived, between the Palais Royal and the Gare de l’Est. 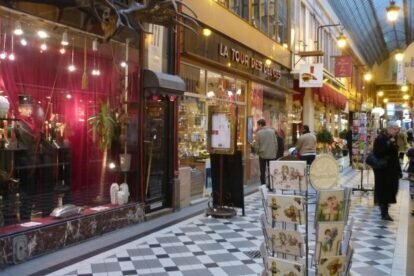 While Passage Brady gets its charm from its exotic atmosphere and its working-class and multicultural surroundings, Passage Jouffroy is, contrarily, one of the most elegant, with its restored pavement and its later cast iron glass roof (1845). You’ll find all sorts of shops there, including unusual ones (like a cane shop) but above all a unique atmosphere that can be found in Balzac’s novels, typical of the Parisian 19th century. At both ends of Passage Jouffroy, you can explore other passages, Passage des Panoramas (the oldest: 1799) and Passage Verdeau (contemporary to Jouffroy, but quieter).